I recently had a few friends over for a special lunch. Of course I always like to add some pretty details when I’m hosting a party, even if the “party” is only 4 friends. For this lunch, I went with a menu and decorations that could easily work for many different occasions… a baby shower, wedding shower, birthday, graduation, or most any gathering of friends. You’ll also notice that I used the same general display techniques that I use for my dessert tables, but with “real” food. When planning the lunch I chose a pretty color scheme of various blues and white (my favorite colors). 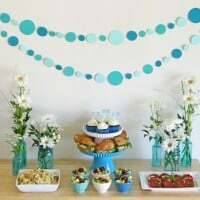 I made a fun polka-dot paper garland (tutorial coming soon) as a cute, yet simple way to set off the food table. I almost always like to include fresh flowers on my tables. I love flowers so much and I think they add great color, texture and life to any display. For this table I chose all white flowers (daisy mums, gerbera daisies and button asters). My favorite places to pick up fresh, yet inexpensive flowers is Trader Joe’s or Costco. Certainly, if you want something very specific and don’t want to drive around to more that one store to find things, placing an order with a florist would be a sure bet. 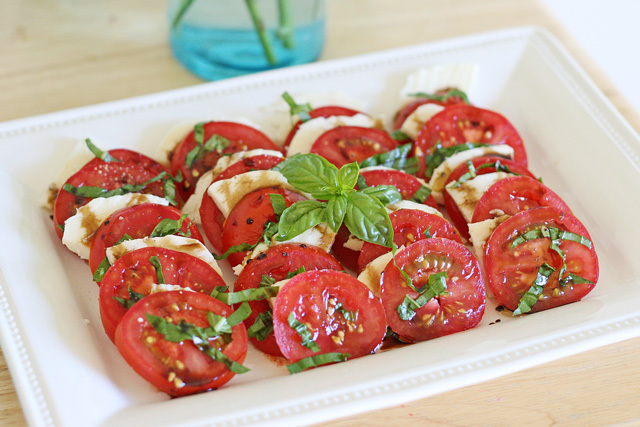 Summer is the perfect time to make a fresh and delicious Caprese salad (ingredients listed in menu above). 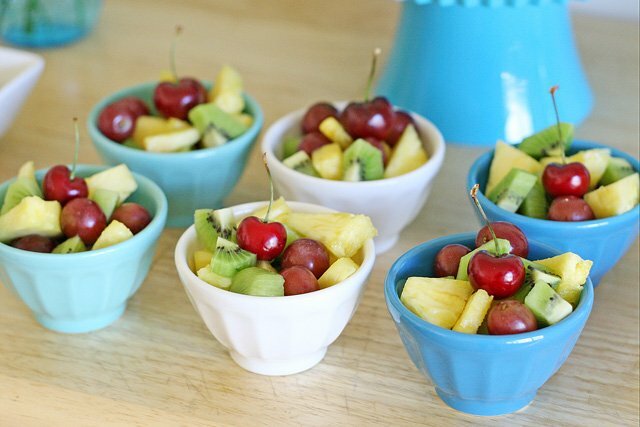 I like to serve fruit salad in individual bowl as a way to make it easy to grab, and a little extra special. I often use this same menu for baby showers, birthday’s or any moderate sized home party. It’s simple, yet beautiful and delicious. Is there a certain dish or menu you almost always turn to when hosting a party? 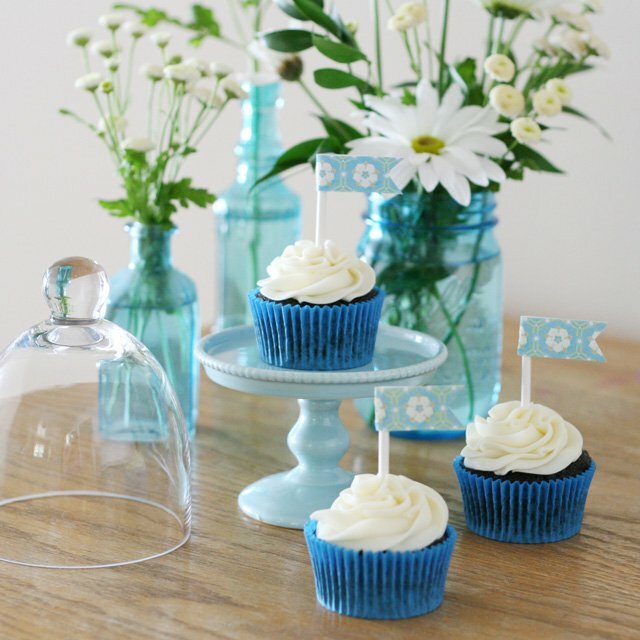 Blue vases/jars – Hobby Lobby (vases) and (jars) Ebay (similar available from Shop Sweet Lulu). Flowers (from Trader Joes) gerbera daisies, daisy mums, button asters. My “go to” party food are Brie Bites: Cut squares of puff pastry ( I make a rough-puff, but storebought is fine) about 1 1/2 inches. Put in the cups of a mini muffin pan. Add about 1/2 tsp jam (I like boysenberry or blackberry year-round, cranberry in the winter) and top with a 1/2 inch cube of brie cheese. Bake until golden and delicious. These are always a hit and can even be par-baked and frozen and then heated through/finished on a baking sheet if you’re feeding a crowd. So pretty. I love the colors. The food looks great too. it looks amazing. i love the colors. i hardly ever make the same dishes when hosting a party. i love switching everything up. 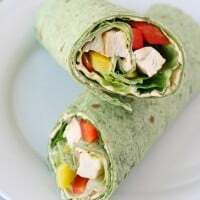 I love and do well get ideas, because I have to prepare a snack next month for a christening of a child. Such a sweet set up! This setup is so pretty! I love blue and the shades you chose just make me happy. This is gorgeous! 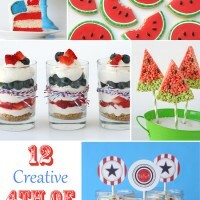 I am inspired to set up a color-coded party!!! You are unbelievably perfect! You are! So pretty! I only wish that I could have been there to enjoy such a nice party and because I love to eat your chicken salad! I hope everyone had a good time and appreciated your lovely lunch. Love you! What a cute idea! I love the polka dot garland in the background! Thanks for posting where you got your supplies too! OMG! This is so pretty. What wonderful ideas. Thank you for sharing. 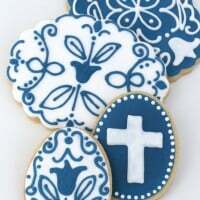 Blue and white is and always has been a classic color combination. 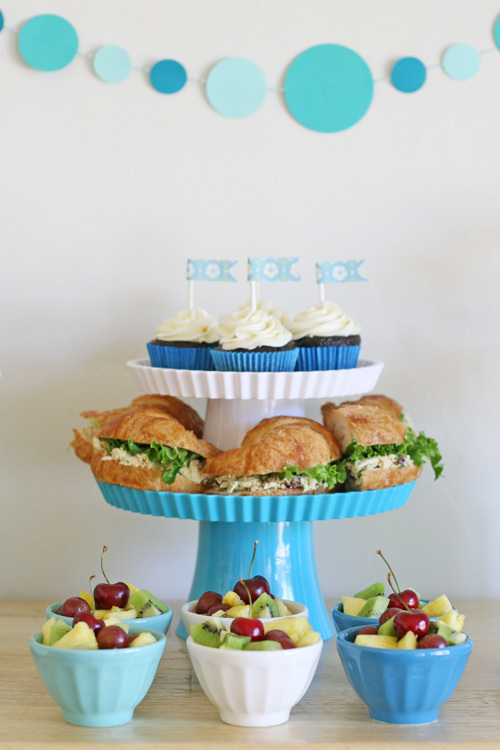 I especially love the way you have used different shades of blue…the deep blue cupcake holders and the lighter blue fruit cups. Lovely! What a perfect colour combination and it all looks delicious! Absolutely beautiful! I love your blog! Where did you ever find those bottles? They are delightful. Are there any chain stores that might have them? I’m in Chicago and would love to get my hands on them ASAP.